Since 1925, the last Sunday of the church year has been celebrated as Christ the King or Reign of Christ Sunday. This year at Holy Cross we celebrated “Jesus the Christ Sunday” with readings from Galatians 3:26-28 and Luke 23:33-43. Yesterday, my Auntie died. Barbara was a kind woman. A good woman. A woman who welcomed me into her home even though we met long after the marriage that tied us together as kin had ended. A woman who welcomed me into her home even though she could scarcely afford to take care of herself and her two children. A good woman who chose to be hospitable, kind, and welcoming, when it would have been perfectly acceptable for her to send me on my way. I was a teenager when I first met my Auntie Barb. I was doing what a lot of young people have done since time began. I left the safety of my home to travel the world. I didn’t have much money, just a back-pack on my back, a few dollars in my pocket and all the confidence of a nine-teen year-old, looking for adventure. Barbara must have been in her late forties when I arrived on her doorstep. Her marriage to my uncle was ending and she was struggling to make ends meet. Her two children, my cousins were just kids twelve and fourteen; demanding all the things that kids have always demanded of their parents. Barbara could barely afford to put their food on the table, and yet when I arrived on her doorstep, Barbara opened her door, invited me in, and took me on as one of her own. Her many kindnesses to me, came from somewhere deep inside of her that said, no matter how tough my own life is, no matter how little I have to give, I choose to give, I choose to be kind, I choose to open my door to welcome, I choose to be hospitable. My Auntie Barbara died yesterday, and the lives that she touched are sorely grieved at her passing, but the world goes on. So, what does it matter that Barbara choose kindness when there were so many other less costly options open to her? Today, in churches all over the world, Christians are celebrating Christ the King Sunday or in as those churches that try to be more inclusive in their use of language, call it, the Reign of Christ Sunday. It is the last Sunday of the Church year and since 1925, the last Sunday of the church year has been used to declare that Christ Reigns; that despite what the world says, Christ and not the rulers of this world reigns supreme. It is no coincidence that Christ the King Sunday began in 1925, by the decree of Pope Pius the 11th. You see in Italy in 1925, there was a king other than Christ. ll Duce, Benito Mussolini rode the crest of fascism to become the supreme ruler of Italy in 1925, declaring himself the heir to the Roman Empire. Il Duce declared that the fascist state of Italy was born out of the eternal need of the Aryan and Mediterranean races to ensure the purification of their people. Christ the King Sunday was established in defiance of Il Duce. The church chose to insist that Christ and not racism ruled supreme. It wasn’t the first time that the followers of Jesus insisted that something other than fear would rule their lives. From the very beginning the followers of Jesus insisted that Jesus and not Caesar is LORD. The very first creed was as simple and as complicated as that. Jesus is LORD. Jesus rules not Caesar. This simple and yet complicated creed, was enough to get you killed in the first century. And yet, people chose to insist that the ways of Jesus would rule their lives and not the ways of the empire. So swift and harsh was the reaction of the Roman Empire to the rebel claim that Jesus rules, that hundreds and thousands of Jesus followers were crucified for insisting that there was another way to live; a way to live free from fear. As the followers of Jesus were persecuted for living in the hope that love and not hate offered a better way, it became more and more dangerous to confess that Jesus is LORD, and so the rebels developed ways of recognizing one another that set them apart from those who lived in fear of the powers of the Empire. The Ichthys, the symbol of the fish arose as a way of identifying those who chose love over fear. Ichthys the symbol of the fish was adopted by the early followers of Jesus because the Greek word for fish, ICHTHYS was an acronym for the word fish. The first letters of the Greek words Jesus Christ Saviour of the World, spell the Greek word for fish. The symbol of the Ichthys was simple to draw; it could be traced in the dirt, quietly so the authorities would not notice, the same authorities that insisted that Caesar was the saviour of the world. Quietly, defiantly, the followers of the way, the way of the one who first called the fishers from Galilee, the rebel Jesus of Nazareth, who dared to suggest that love was more powerful than fear, chose to identify themselves with the symbol of the fish. It wasn’t until 364, when Constantine co-opted Christianity as the religion of the Empire that the Cross usurped the fish as the symbol of Christianity. The adoption of the cross, the instrument of state execution was an act of defiance. The most fearful symbol of Roman oppression was transformed from an instrument of torture into a symbol of torture and death’s inability to kill hope. Where once the Roman Empire had used crucifixion to terrorize the peoples they had conquered, the very people they conquered used the sign of the cross to declare that hatred could not kill love. The forces of hatred over and over again have used fear to drive out love. Over and over again, people have found ways to resist hatred in spite of their fears. History is littered with stories of leaders who have insisted that the only way to survive is to play to our fear. Fear mongering is nothing new. Fear mongering has often tried to dominate the hearts and minds of people. During the darkest days of the second world war, when the fascist regime of Germany’s Third Riche rose to power they did so, by playing on the fears of the German people. But despite the fearsome methods of the loathsome fascists, there were those who continued to choose not to be ruled by their fears. There are all sorts of stories of those who resisted insisting that fear would not rule their lives. There is a story of quiet resistance that happened Norway after the Norwegians were defeated by the Nazi’s. In the darkest days of the German occupation some Germans, adopted the symbol of the paper clip, worn in their lapel pockets as a symbol that hatred would be defeated. As powerful and as frightening as those dark days were, there were those who choose not to be ruled by fear. A symbol as innocuous as a paper clip, declared that love and not hate would rule the day. Once again there are those who seek power by playing to our fears. Symbols that we thought had been banished to the pages of history are being drawn on mosques and synagogues all over the world. Just this past week, in Ottawa and in Toronto Swastikas have declared that we should be afraid and let hatred rule. Once again there are those who choose not to let fear rule. Safety pins are appearing everywhere declaring that despite the best efforts of those who choose fear and hate as their rulers, hatred will not be allowed to rule those who choose love. Something as innocuous as a safety pin has become a symbol of hope as people declare themselves safe places for those who are being oppressed. The human spirit is an amazing and fragile work of beauty. The human spirit can and is often crushed by fear and hatred. But the human spirit can also be restored and empowered by love. We can choose to live in fear, or we can choose to live in hope. Our fears can feed hatred. Our hopes can feed love. For those of us who seek to follow the teachings of the one whose love could not be conquered by what at the time appeared to be the most powerful Empire on earth, symbols like the fish, the cross, a paper clip and a safety pin point to a way of being in the world that moves us beyond our fears so that love is empowered. The symbols in and of themselves are nothing really, just signs pointing to something beyond the powers that be, to something capable of giving life to love. Sometimes the horrors of our history are so overwhelming that we begin to fear that fear itself with conquer us. Sometimes, in the face of the enormity of our fears, all we need is something simple like a sign, or a symbol to point us beyond our fears so that love can triumph over fear and hatred. Sometimes that sign comes in the form of a fish, a cross, a paper clip, or a safety pin, and sometimes that sign comes in the form of an open door, a welcome, a hot meal, a cup of water, a warm embrace, or the presence of a friend or ally. The symbol itself is not much in and of itself; insignificant really in the grand scheme of things, but more powerful than the most potent rulers. When you think about it, Jesus himself is but a sign, a symbol pointing beyond himself to the most potent thing in all of creation, the power of love over fear. My Auntie died yesterday. Hers was an insignificant death in the grand scheme of things. But the love she embodied is more powerful than death. The love she embodied lives on in all the lives she touched. We can live into our fears or we can live beyond our fear. 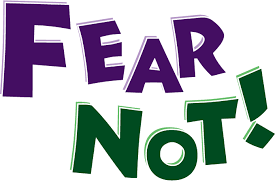 We can be ruled by those who use fear to rule or we can be ruled by a power greater than all our fears. Choose LOVE and live beyond our fears. Choose LOVE. This entry was posted in Evolutionary Christianity, Home, Progressive Theology, SERMONS, STORIES, Theology and tagged emergent theology, progressive Christian sermon Christ the King, progressive Christian sermon Luke 23:33-43, progressive christian spirituality, progressive christianity, progressive theology, Reign of Christ sermon by Rev. Dawn Hutchings. Bookmark the permalink.